The Mythos corsets give you the chance to wield the power of myths around you like an armor, wrapping you in legends, bringing out your inner strength and attitude for all to see. Do you roar like a dragon, blaze like a phoenix, growl like a cerberus or soar like a griffin? Does your love for the sea match the lethal attitude of a kraken? Does your mood before morning coffee resemble medusa’s? Show it off! There’s a HUD of six different mythical creatures to change the corset with: dragon, phoenix, cerberus, kraken, griffin and medusa. You’re actually getting six corsets at the price of one! 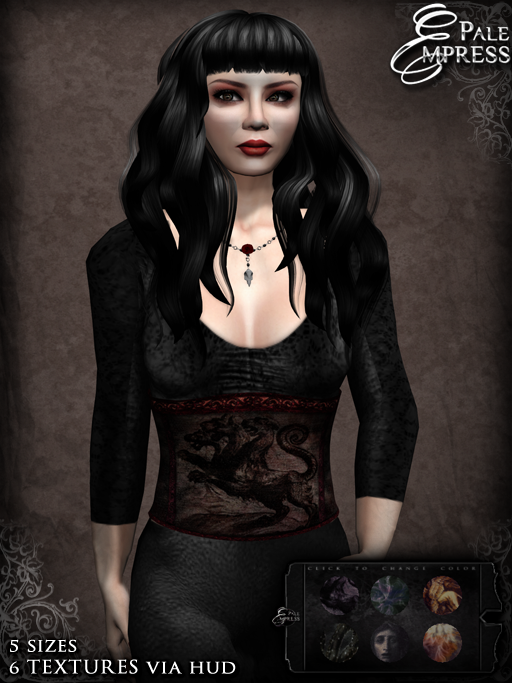 The corset is a rigged mesh item that moves with your avatar. It comes in the five standard sizes. Please try the demo. Please note that the texture-change script will make the corsets appear no-mod in inventory, but they are as modifiable as rigged mesh can be: if you wish to tint them, you absolutely can.